The Hallmark Channel movie Love in Design will debut on September 16 at 9 PM. 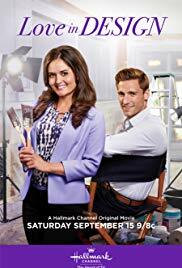 Hannah’s (Danica McKellar from Wonder Years) television show “Love in Design” is known for modernizing outdated spaces, and she is now renovating a historic manor in her hometown. Up for the challenge, she’s not ready to work with the overseeing architect, her ex-boyfriend Jeff (Andrew Walker from When Calls the Heart), especially since their attraction hasn’t waned. Revamping such an old building and having an opinionated ex on set is hard, and Hannah must make their Ying/Yang approaches blend. At the same time, maybe Jeff can reach beyond his comfort zone and overcome the distance between them. Here is a trailer for Love in Design.